Brother has launched a new range of compact desktop and mobile scanners with a suite of software designed to speed up productivity. The three new Brother scanners are based on the scanner technologies used in Brother's multifunction printers. The range consists of a high-speed, compact desktop scanner (ADS-2100), and two mobile scanners (the DS-600 and the DS-700D), and include software designed to quickly turn hard-copy documents into searchable, shareable digital information. Brother's new mobile scanners (the DS-600 and the DS-700D), are powered from the USB cable so there's no need to cart around yet another charger and feature "one touch" scanning. The mobile devices offer all of the features you would expect on a larger desktop scanner – the DS-700D even does double-sided scanning - and are light-weight (DS-600 0.32Kg DS-700D 0.6Kg) and small enough (DS-600 80 x 310 x 230mm DS-700D 120 x 395 x 230 mm) to not weigh you down. The ADS-2100 desktop scanner is described as being "ideal for fast scanning of high quality documents up to A3," and is compatible with Windows, Mac and Linux. The scanner is designed to overcome the difficulties of digitising a wide range of materials, and is able to scan various different types of documents at once with its built-in multipage detection. 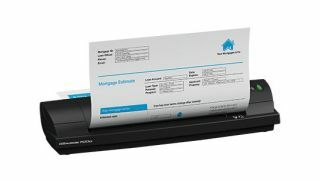 It has a 50 page auto document feeder, offers double-sided scanning in colour, black and white, and greyscale and is capable of scanning up to 24 pages per minute. The ADS-2100 scanner has a unique feature that enables users to scan directly to a USB host, such as a memory stick or portable disk drive, and users can also scan directly into Microsoft Office software, in order to edit documents. All the new scanners come with a suite of bundled software, for quickly turning scans into searchable PDFs, and making it easy to find archived files using key words. The suite also includes Bizcard software, which enables users to easily scan in business cards, adding them directly into contact databases and removing the need to manually update spread sheets. The scanners are priced (ex-VAT) at £125 for the DS-600, £195 for the DS-700D and the ADS-2100 is £450.